Every year, we talk about what we loved about the past 12 months of geeky entertainment. It's usually under the guise of discussing what to honor with our Escapist Awards, but we always seem to gravitate toward that list of five unique things that especially moved us this year. It could be cute, it could be have emotional impact, it could be just downright silly, but each of the things on these lists means something to us. Here's what some of The Escapist's most passionate video game enthusiasts picked for their five favorite things from 2014. Check out all of our Five Favorites here! The first full year of next-gen consoles has been a tad less ambitious than I was hoping, but I've had a damn good time along the way all the same. Despite investing in a next-gen console right around launch last year, I've been struggling to find games that justify the expense, given that most games coming out are available across console generations. On the other hand, my 360 finally red ringed, so as long as we don't have too many more Borderlands the Pre-Sequel situations - BLTPS is only available on last-gen consoles and PC - I'll be okay with it. That said, there were some outstanding games on next-gen consoles, as well as an abundance of fantastic PC games, and a spattering of last-gen goodness for the tens of millions of last-gen owners out there who haven't taken the plunge quite yet. Looking at PC, and both generations of consoles, here are my Five Favorites for 2014. One feature I'm particularly glad doesn't exist in Hearthstone is "/played," which tells you just how many hours, days, weeks you've spent in game. Being a sucker for punishment, I did a rough estimate and came up with two weeks. Yes. Weeks. The kicker is that I'm still playing at least a match virtually every single day. From Arena to Ranked to Naxxramas, every single mode available in Hearthstone adds something valuable to the overall experience. 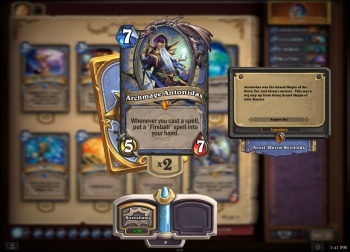 Despite the limited selection of cards, the diversity of viable strategies has given Hearthstone an incredible amount of longevity. Whether you play Zoolock or Miracle Rogue, you've got nine unique classes to tinker with during deck building, and every single class has been represented in some form or fashion in tournament play, which speaks to the delicate balance that Blizzard has achieved with the game. It's easy to learn, fun to play, and can be enjoyed for exactly zero dollars. Naturally, this gives Hearthstone a roughly infinite fun-to-dollar ratio. Not a bad deal. 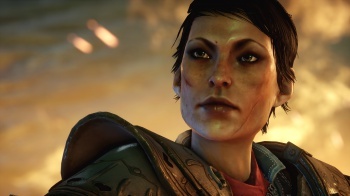 Having never played a Dragon Age game before, I wasn't an early adopter of Inquisition, but as I watched my wife play it, I was drawn in and, before I knew it, I was in control of a four-mage party, casting an endless stream of spells at anything that dared cross my path. One night, I simply wandered through the wilds of Thedas for hours doing side quests, closing rifts, and incinerating everything even remotely flammable. At this point, I can't even spoil the story for you, because I haven't actually advanced the plot since I took control. As a lover of stories in games, this is particularly telling of the quality of the experience. After having cooperatively sunk at least 30 hours into the game, we hit a mission that more or less concluded the prologue and brought us into the actual game. The depth of the world and characters, combined with the freedom to do more or less what you want at most points in the game add up to a genuinely amazing overall experience. It's not without its flaws, of course. Namely a Stash of any sort and a Knock spell so my all-mage party can get past the locked doors that seem to bar story progress in too many cases, and it'd be nearing perfection. 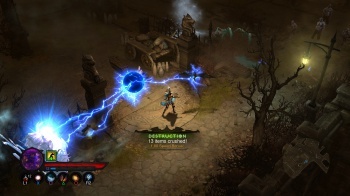 Runner up in the "I've spent way too much time in this game" category is the expansion to Blizzard's 2013 dungeon-crawling lootfest, Diablo III. I got awfully fed up with D3 after a couple of short months, what with the loot drops being useable approximately 1% of the time, and the Auction House being a pit of despair for anybody that wasn't interested in sinking hundreds of hours or tens of dollars into a single piece of slightly-better gear. It was an intensely fun game, mind you, but it had very little staying power. I didn't pick it back up until Reaper of Souls hit, and I was so glad I did. Blizzard fixed virtually every niggling problem with the base game, and it was good. From tailored loot drops, making 9/10 Legendaries useable, to the now-permanent 100% boost to Legendary drop rates, to Adventure Mode and Nephalem Rifts, the new and improved D3 experience was truly that. It's worth mentioning that the console port of Reaper of Souls, dubbed Ultimate Evil Edition is also strictly fantastic. It's a whole different experience on console vs PC, but as a dungeon crawl, it's an absolute blast. Considering the local co-op, the arcade-style Massacre, Destruction, etc counters, and the permanent legendary drop rate boost, the console version is nearly on par with the PC. Except that you can't target Black Holes and Meteors, so I had to go an entirely different route with my Wizard build. Nazis, Nazis, Nazis. You'd think that after a near-infinite number of WWII shooters we'd be tired of killing them, but here we are, another year, another Nazi killfest. And you know what? It's still good. Given that Wolfenstein 3D is actually one of the games that originally popularized the entire concept of a shooter, it should come as no surprise that it was one of the very first WWII shooters as well. It's been over two decades since 3D came out, and some things have changed. The New Order tosses you into an alternate reality where the Allies lost the war, and the Nazis have developed all sorts of devastating technology to keep themselves in power. There are some fanciful weapons, of course, but most of this technology has been channeled into giant death robots, which you'll have the pleasure of taking down more or less by yourself. The New Order is something of a huge leap forward for the series, however, as it's more than just killing endless waves of soldiers. It actually has a plot. There are actual characters who have actual backstories. Also, giant robots. Whether or not you care about Middle-earth, Tolkien, or hobbitses, Shadow of Mordor is a genuinely amazing experience. It's got a weird reverse difficulty curve, where combat starts out as a bit of a challenge, but as you unlock abilities through experience and story progression, you'll get to the point where the combat is a fun distraction, rather than the most trying aspect of the game. It does an amazing job of making you feel like you're growing in power as the story dialogue explains how you're growing in power. There's the Nemesis System, which gives Uruk warriors names and special traits, and has them contend with each other for power among the ranks, as you slay one, only to have others step in to fill the gap. 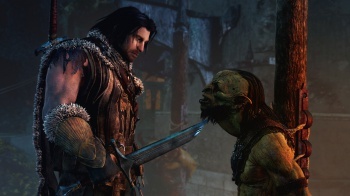 Shadow of Mordor is impeccably designed in virtually every regard. The combat is insanely fun, especially when you've gone from taking down small raiding parties to frontal assaults on army encampments. You'll Brand some, forcing them to fight by your side. You'll interrogate others, gaining precious intel on the strengths and weaknesses of your next target. You'll simply lay waste to many, many more, who made the mistake of getting in your way. That's it for my Five Favorites of 2014! Be sure to check out the rest of The Escapist's Five Favorites!